Network Programming - TCP Connection Establishment | The Daily Programmer '+g+"
It is called as 3 way because minimum 3 packets are required for connection establishment. 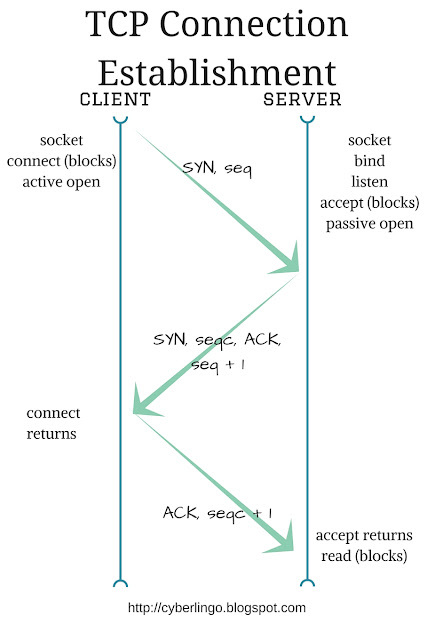 Server calls socket, bind and listen functions and becomes passive open. Client issues active open by calling connect, and sends SYN segment ( containing client's initial sequence no. ) to the server. Server sends SYN ( with sequence number ) and ACK in a single segment. MSS - Maximum Segment Size - The maximum size of the segment that can be used in connection. Window Scale - New option, so should be supported by both ends ( client and server ). It specifies if the advertised window needs to be scaled, as faster connections or long delay paths requrie larger window size. Timestamp - Timestamp to make sure delayed or duplicate segments are not processed.